With your busy schedule running from the gym to the office, itâ€™s hard to find any time to sit down and eat a weeknight meal â€” let alone cook. Cooking can require a lot of effort on your part, from dinner ideas to grocery shopping, but just every so often you can find the ideal recipe that requires only 15 precious moments of your time. Seemingly rare and hard to find, 15-minute meals are actually an upcoming trend and don't need to be boring. You can find some incredible Italian, Asian, or Mexican dishes while also staying on track for specific dietary requirements like healthy recipes or gluten-free dishes. Here are the most delicious dinner recipes that are healthy without the effort. You can whip up these 24 quick recipes in the midst of your busy evening â€” no mess, no fuss. 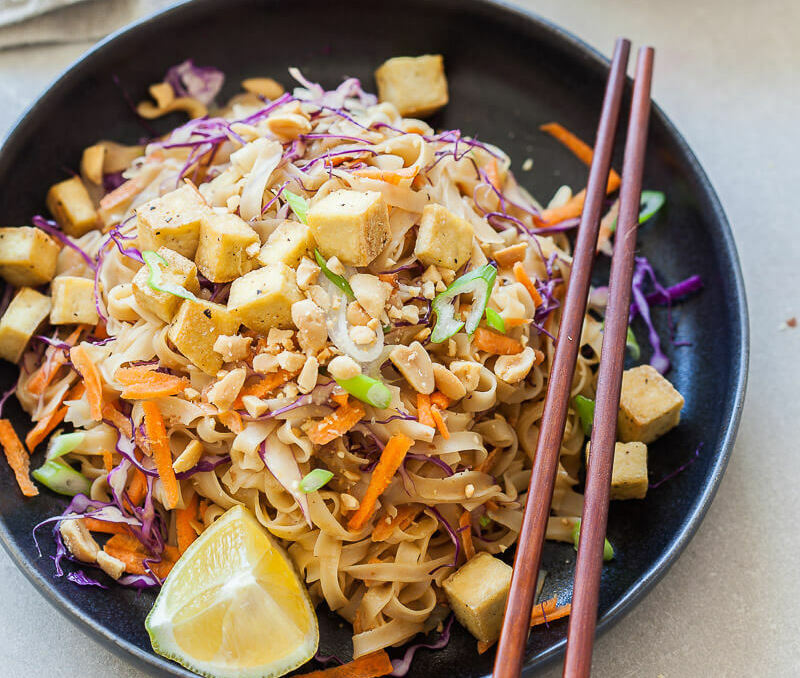 Although hard to believe, this delicious vegan pad thai with tofu in peanut sauce can be whipped up in 15 minutes flat. Better than that, it's gluten free and completely plant based. This dish uses rice noodles, which cook super fast, so you're really only left with the delicious peanut sauce. Most of the ingredients youâ€™ll likely already have at home, like peanut butter and carrots. You're going to want to fight the urge for takeout after reading this super speedy 15-minute recipe. 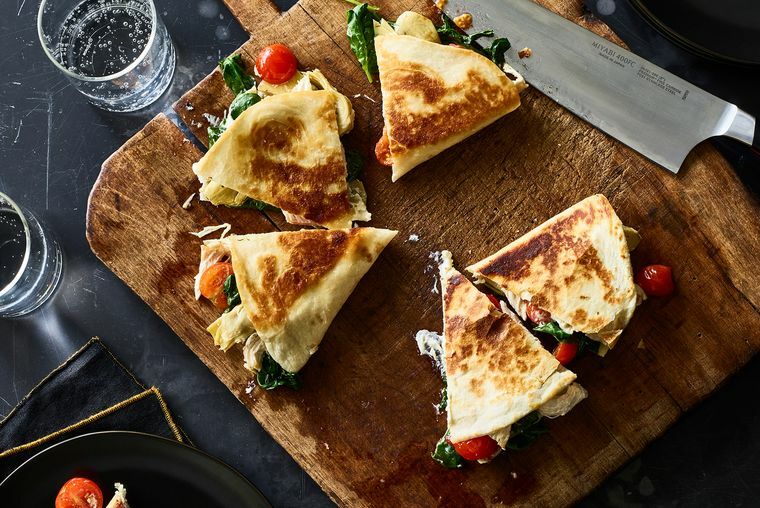 To really get this creamy chicken florentine quesadilla really creamy, you'll need two very basic kinds of cheese â€” cream cheese and Parmesan cheese. Feel free to play around and use other types. Throw all the ingredients over a griddle or in a skillet, cook on both sides until toasty brown, and you'll swear off fast food for life. Or at least another 24 hours. You don't have to be a vegan to enjoy fresh vegan food, and this creamy vegan garlic garbanzo puree is a great go-to for your weeknight meal, especially if you're looking for something light but creamy. 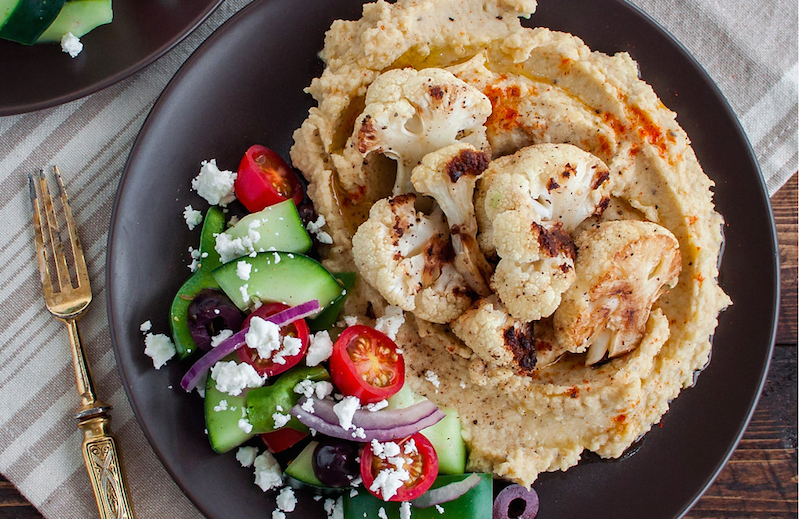 Although easily confused with hummus, this twist on the Mediterranean staple pairs well with Greek salad and roasted cauliflower. 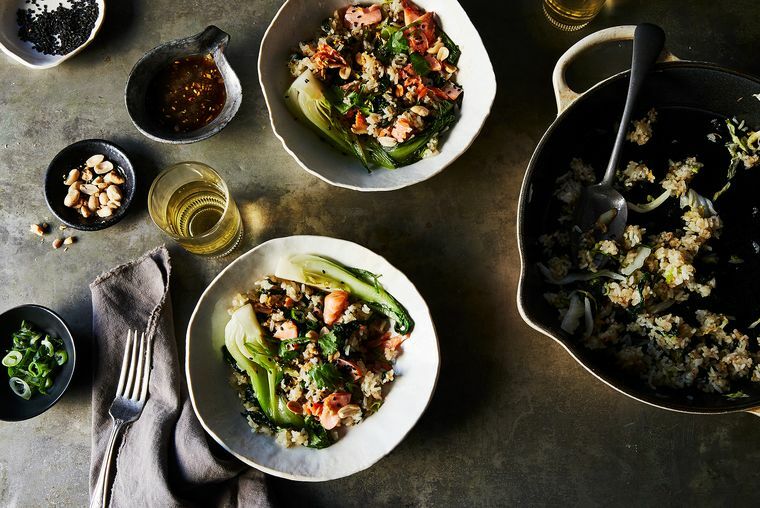 Stir-fried rice with leftovers is a great dish for busy weeknights or for when you want to impress, but you'd rather leave out the hard work. This 15-minute dinner will only really work if you have some leftovers already in the fridge, but considering that's pretty common, this recipe is a lifesaver. Brown rice works really well with this stir-fry if you donâ€™t have white. Even if you don't have leftover rice, you can still cook everything from scratch in no time. Pick a protein of your choice and throw all your ingredients together in a pan. 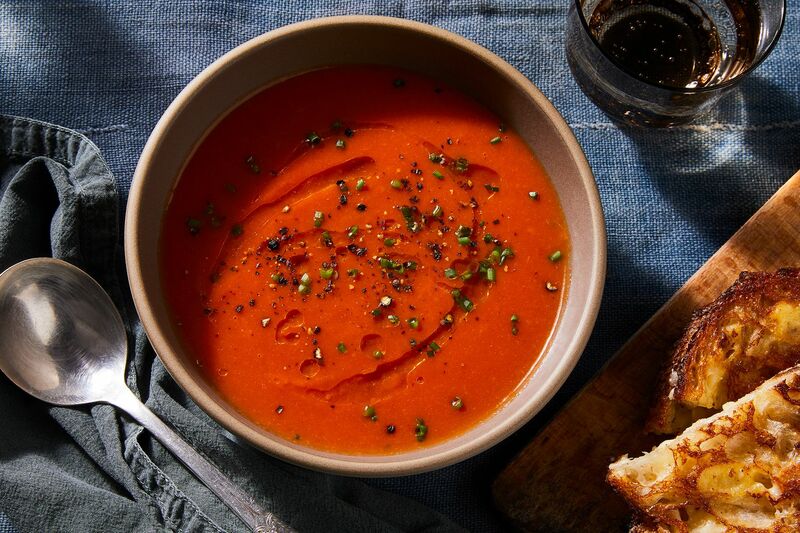 Creamy and vegan might not go together in your mind, but this perfect 15-minute vegan tomato soup is just that. This easy dinner is great for cozy nights indoors, and itâ€™s a dish your entire family will devour. Use cans of diced tomatoes to save precious prep time. Olive oil and some other delicious seasonings are all you need to complete this classic weeknight dinner. If you're neither vegetarian or vegan, you can still embrace vegan food or make one night of the week meatless. Vegan mousakka bowls are a fun alternative to the classic Greek dish traditionally made up of lamb, eggplant, and tomatoes. This dish is a great way to get your vegetables in, while still getting all the flavors and textures you get from a regular mousakka bowl, in less than 15 minutes! 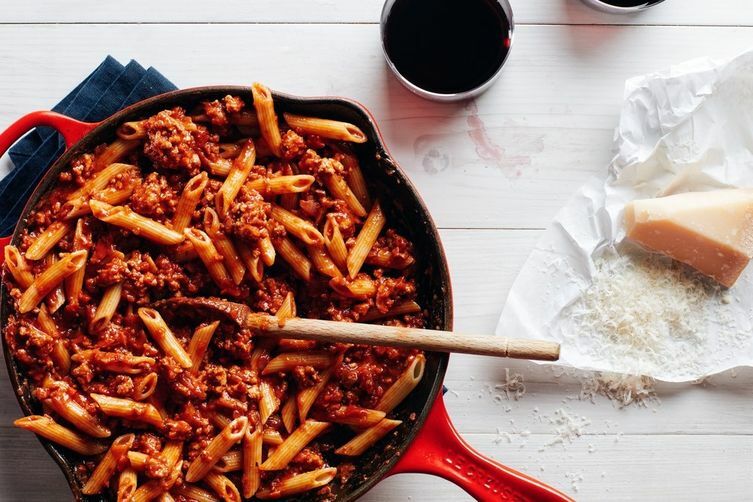 Pasta and meat sauce is an old favorite for a good reason. It's delicious and pleases almost anyone sitting across the table from you. Whip up the meat sauce while the pasta is cooking and you can pick the meat of your choice â€” this dish will work well with pork or beef. You can also pick whatever topping you have on hand. Parmesan cheese works well, as does a simple sprinkle of salt or pepper. Martha Stewart has waged war on the frozen meal and claims that itâ€™s possible to do both quick and nutritious. 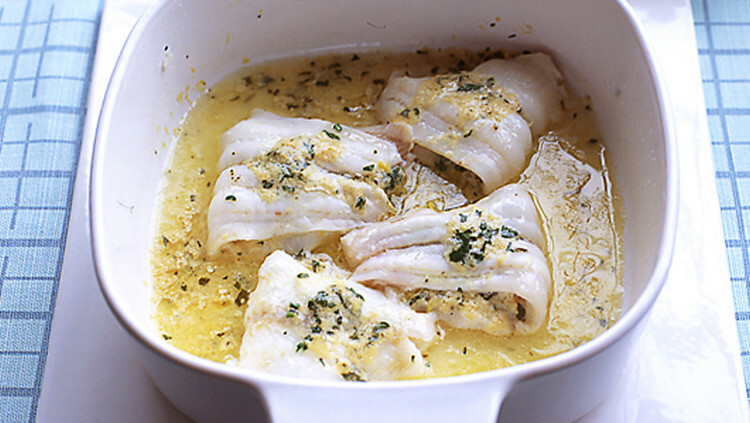 Take this lemon horseradish sole. 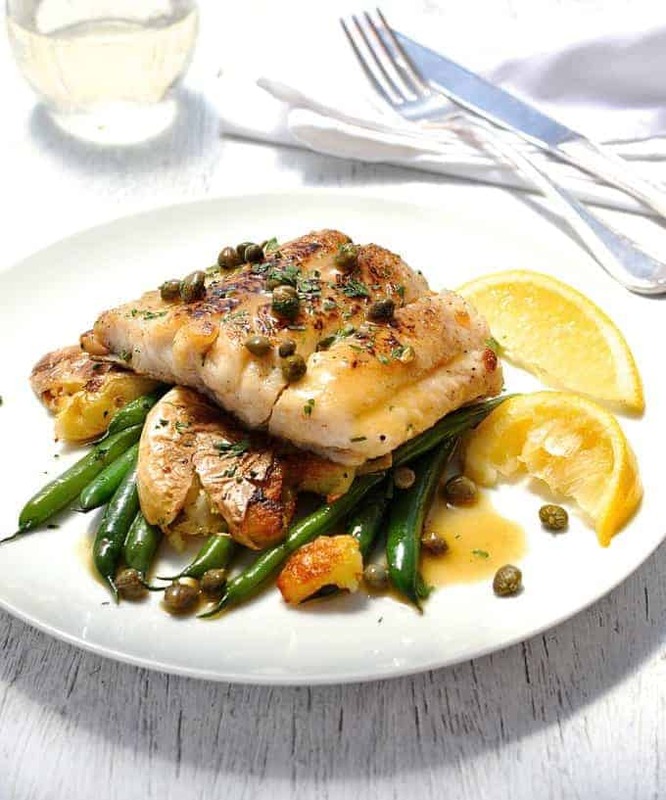 Utilizing the magic of your microwave, this fish dish can be transformed in 15 minutes or less, including prep time. The ingredients are all made up of kitchen staples, and you don't even need to use an oven! Chicken is a dinner staple for a good reason. Everyone loves a good chicken recipe; it's high in protein while also diet friendly. 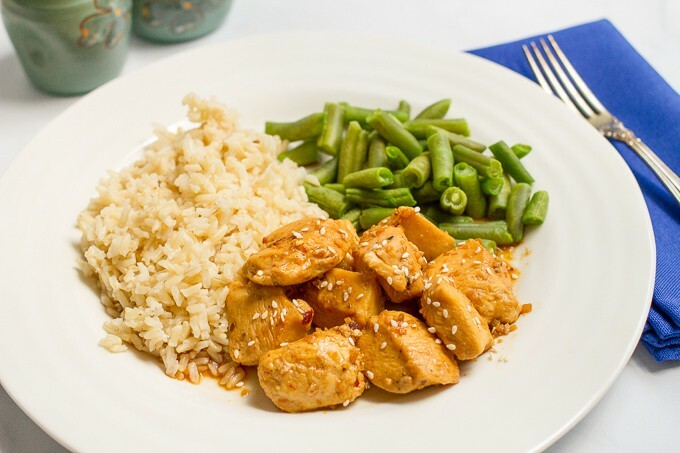 This honey garlic chicken uses chicken breasts and a delicious honey and garlic sauce. This recipe is so quick, you'll actually want to be careful not to overcook the chicken, so a rapid five or so minutes over a large skillet and you're done! Disclaimer â€” the sauce is addictive. Cauliflower is a fun and versatile staple to keep at home, and it can be transformed into a veritable masterpiece in minutes. With just a few other ingredients like soy sauce and lime, you can control the spiciness of this dish depending on how much sriracha you use. 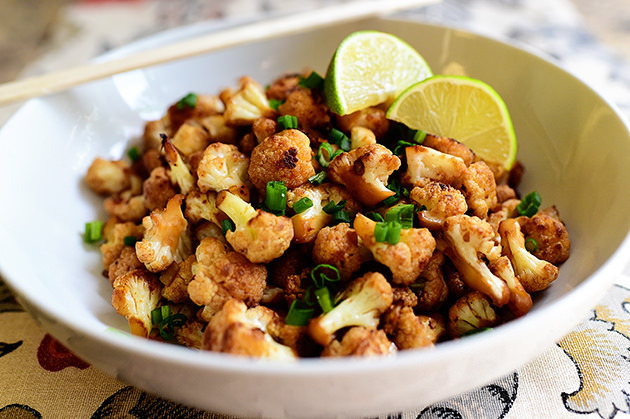 Spicy cauliflower stir-fry works well as a side dish or as a quick lunch. Think pizza is off the menu when trying to get a quick dinner sorted? Think again. Buy pre-made naan bread to use as a base, throw on some mozzarella cheese, tomatoes, and basil, and you'll actually find you enjoy homemade pizza better than the local pizza joint. 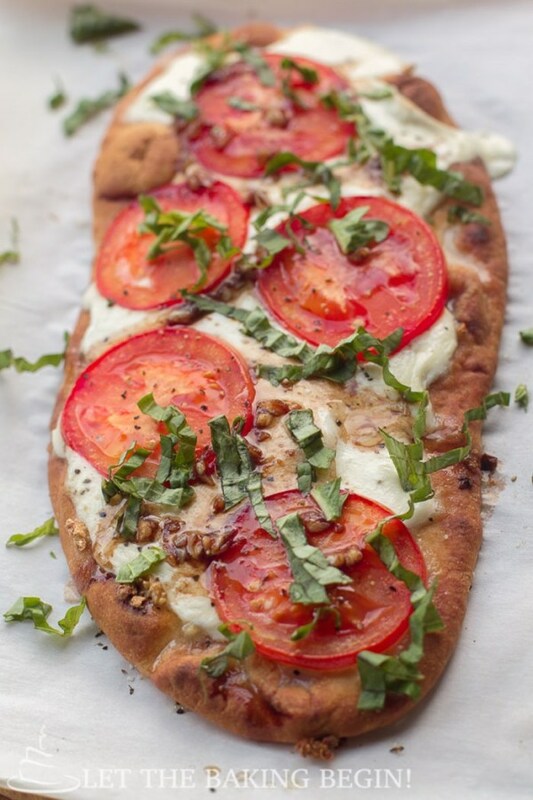 This easy margherita flatbread pizza will soon be a favorite that can be enjoyed at all hours of the day. Shrimp are surprisingly quick and easy to cook, so they work really well when trying to throw dinner together â€” fast. The crunch of the fresh vegetables is a classic combination with the shrimp, especially topped with citrus dressing. 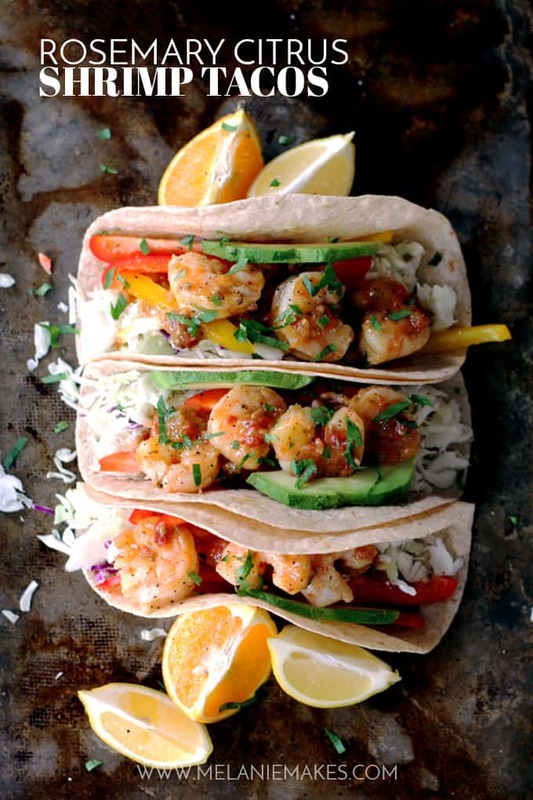 Rosemary citrus shrimp tacos work well as a side dish for a more formal dinner or a main dish on a busy weeknight. 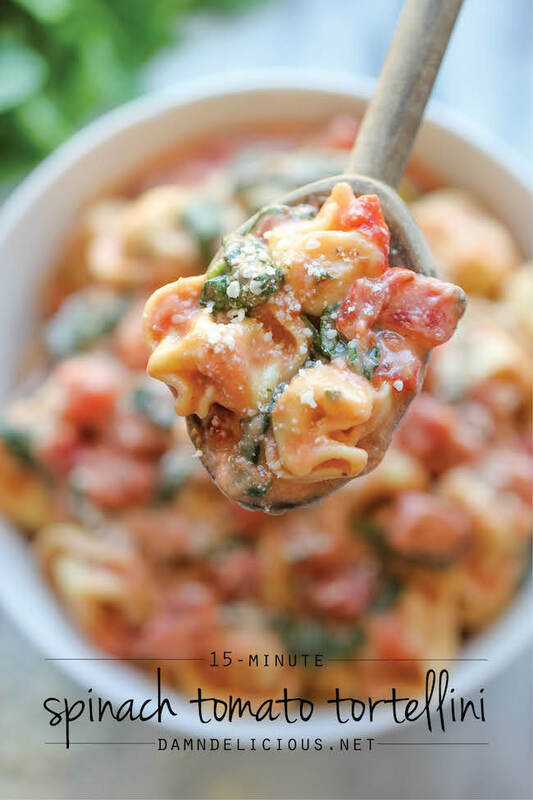 Everyone loves a good Italian dish, and this creamy spinach tomato tortellini is the best way to enjoy some comfort food. Just keep some tortellini in the kitchen and you can whip the entire dish together in no time at all. Enjoy on your own on a weeknight or with a group of friends on a lazy weekend. Sometimes all you want is a simple salad for dinner, but you still want to be left feeling full. 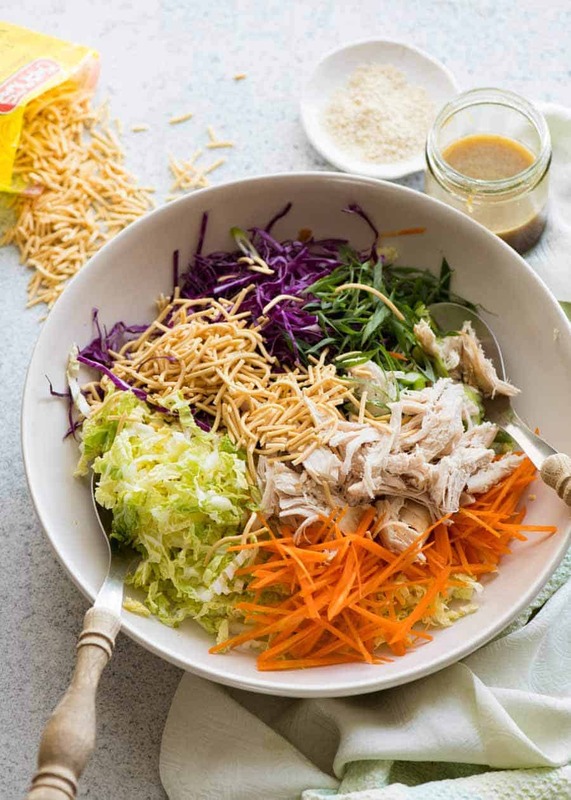 This Chinese chicken salad is the ideal lunch or dinner go-to dish. All you need to worry about is throwing together a tangy dressing made up of soy sauce, sesame oil, rice vinegar, and garlic. Nobody will believe you pulled this fish piccata with crispy smashed potatoes dinner together in 15 minutes. Fish is a great ingredient for rushed meals because it cooks so quickly and there's very little prep time. Just pick up some white fish filets and mix and match some the vegetables. The sauce is fresh and fantastic, and you'll still have time to put your feet up. 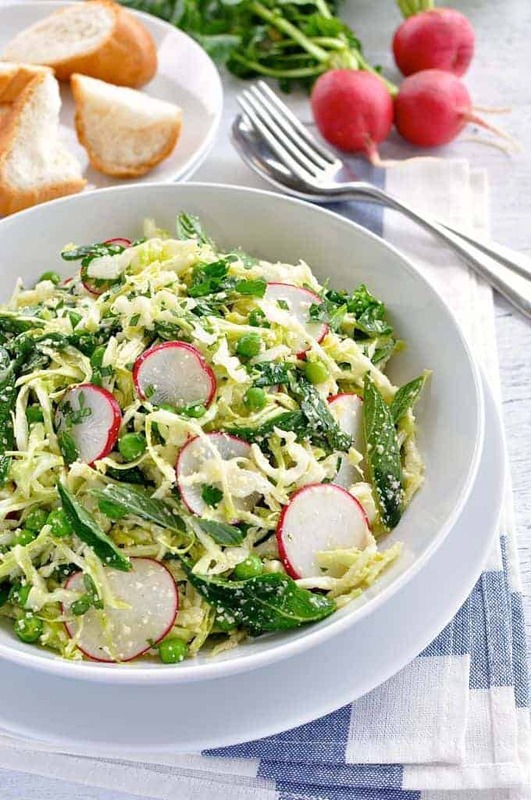 Don't expect leftovers for this pea, cabbage, parmesan, and mint salad. It's the perfect salad to eat any time of the day, and throwing everything together takes no time at all. You can even use frozen peas! Leave out some Parmesan for garnish and voila! 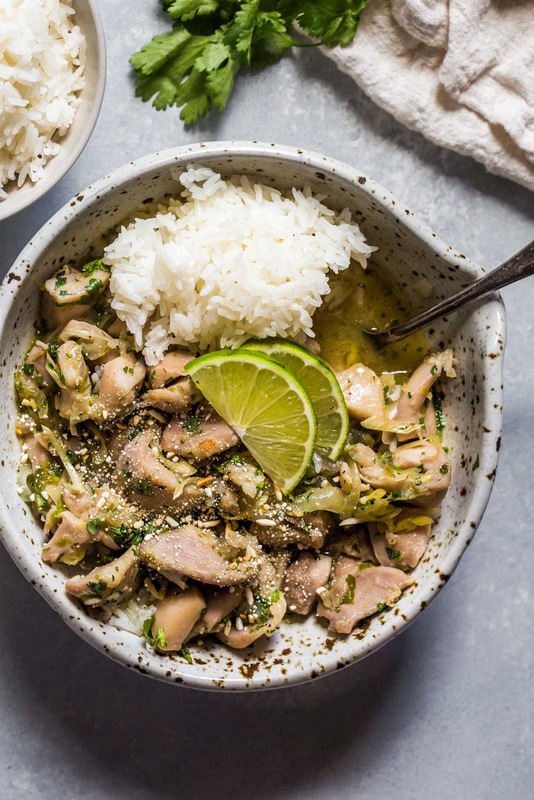 If you're organized with your ingredients, this seemingly complicated Vietnamese lemongrass chicken dish can take as little as 15 minutes to whip up. As long as you've left your chicken marinating in the fridge the night before (or for as little as 4 hours), you can throw everything together in a flash. The taste of the marinated lemongrass works amazingly well with the jalapeÃ±os, garlic, and chicken. With these quick meals at your disposal, you can still have a home-cooked meal when youâ€™re in a mad dash. Eating at home is typically healthier and better-tasting than greasy takeout. As long as you make some shortcuts here and there and stay organized with grocery shopping, you'll be surprised at what you can do with 900 seconds.